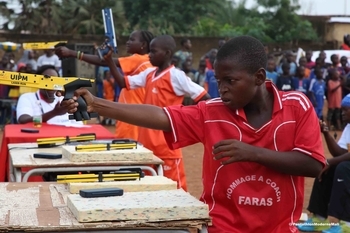 Fifteen months after the formation of the Mali Modern Pentathlon Federation (FMPM), coaches in the country have been given their first opportunity to gain qualifications under the UIPM Coaches Certification Programme (CCP). Sixteen coaches, mostly PE teachers, attended a Level 1 CCP course in Bamako delivered by UIPM instructor Xavier Cugat of France. The five-day course (March 23-27) took place at the National Institute of Youth and Sports and the graduation ceremony was attended by FMPM President Ismaila Lingany and Secretary General Moussa Koumaré. Following the Level 2 CCP course in Cairo (EGY) earlier this year, the initiative highlighted UIPM’s drive to grow the pentathlon movement in Africa and in particular to support the development of recently-created National Federations. Mali already organised a Category B Laser Run competition in the capital city of Bamako September 2018 and this year there will be a Global Laser Run City Tour and a Biathle-Triathle National Tour on September 7. Mali and its fellow French-speaking neighbours – Senegal, Ivory Coast and Burkina Faso – are showing positive signs of development in West Africa, creating training and competition opportunities. Christian Roudaut, Chair of the UIPM Coaches Committee, said: “It was a great delight to see 16 coaches in Mali take their first step on the ladder of the CCP and gain a Level 1 qualification. Visit the UIPM educational platform to find a range of resources for athletes, coaches and judges.